With the markets in slow recovery mode, how do you attract and retain more high-net-worth clients? Our panelists will discuss the latest concerns and interests of affluent investors, and how you can better serve their needs in the new climate of recovery. *Is there a distinct “Wealth” mindset? Join Rob Passarella, Vice President of Institutional Markets for Dow Jones, and Bram Stalknecht, CEO of SemLab, for a one-hour webinar, "From Analytics to Alpha" discussing how firms can add a layer to their trading models with the right tools for deriving sentiment signals to mitigate risk and maximize profits. Join the Forex Regulation webinar from Dow Jones to learn what changing regulations mean for brokerage firms and the online FX trading community in the U.S., Europe, Japan, China and elsewhere. Private equity compensation is slowly recovering from the economic downturn. But how will the economy's global aftershocks impact your ability to hire talent in the year ahead? Don't miss this opportunity. Sign up today for this timely discussion. The stock market is widely seen as a leading indicator for the economy which in turn influences longer-term equity trends. It’s important to track changes in the market to gain insight into the longer-term health of the economy. This session will provide an introduction to technical analysis, showing how to identify some key patterns that can foreshadow market moves. In addition, we will dive into how reading the charts of several different stock market segments, as well as other asset classes, can help predict movements in the broader stock market, as well as the economy. Ian Salisbury will discuss how the mechanics of exchange-traded funds shed light on controversies surrounding the funds’ performance during the flash crash and the recent municipal bond melt down. He will also speak about how those mechanics make ETFs sometimes more tax efficient than mutual funds. With emerging markets in the spotlight, you need to know how they’re reshaping today’s investment strategies. Join us for this Audio Webcast where we will discuss the global paradigm shift that’s now impacting investors, especially in the BRIC markets—Brazil, Russia, India, China—and analyze why these emerging markets are overturning some long-held assumptions. You’ll learn where the demand is the strongest and what’s driving it, how emerging markets are forcing investors to rethink risk, what the performance of emerging markets say about developed markets, and what is the place of emerging markets in allocation models. 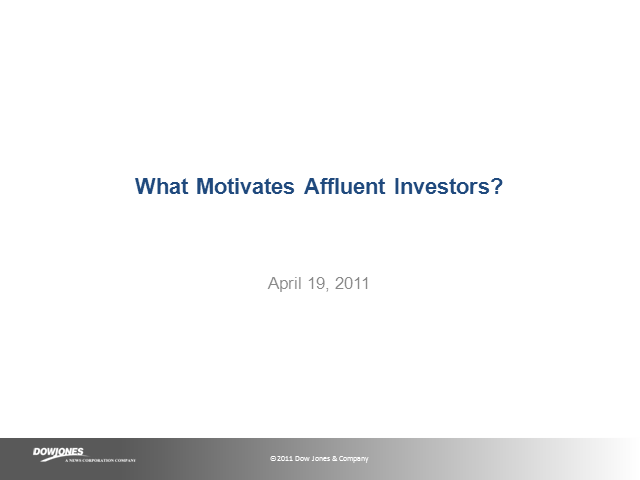 Title: What Motivates Affluent Investors?